Liverpool take on Southampton at Anfield on Saturday afternoon, and there’s a full debut for Xherdan Shaqiri after his summer arrival. The Merseyside giants have made a perfect start to the campaign, winning all five games thus far while scoring 11 goals and conceding just two. 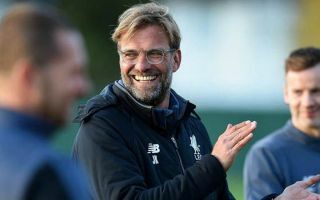 Jurgen Klopp will undoubtedly hope to see more of the same this weekend, and he’s gone with a strong starting line-up, as expected. Roberto Firmino returns to the XI after being benched in midweek due to the eye injury that he sustained last weekend against Tottenham, with Daniel Sturridge dropping to the bench. Meanwhile, Joel Matip replaces Joe Gomez in defence, while Shaqiri comes in for his first start since his summer move from Stoke City, having previously been limited to appearances off the bench. Based on the reaction below from some fans, it’s fair to say that they’re looking forward to seeing what the Swiss international can do with a full game to make his influence felt, and he’ll certainly be eager to impress to keep his place in the side moving forward. It’s a rather attacking line-up from Klopp given he’s deployed Shaqiri in midfield with the trident of Mohamed Salah, Sadio Mane and Firmino leading the charge, and so perhaps the German tactician believes his side will dominate possession at Anfield, and so they need that additional creativity to ensure that they find breakthroughs.